We learned that redevelopment, big time redevelopment, will now move forward for the corner of 10th and F St NW starting at the end of 2013. We’ve followed this corner since Douglas Jemal of Douglas Development purchased the properties in 2006 declaring that an 11 story building would follow. That redevelopment is now moving forward thanks to a partnership between Douglas Development and CBRE to the tune of exactly that, an 11 story office building, which will also include ground/lower floor retail. The K & B Newsstand and the Downtown DC BID were located in the two buildings adjoining that corner on F St NW before they closed and moved respectively. Currently, those properties house souvenir shops and FrozenYo. The Waffle Shop on 10th Street closed some time ago. As of now there are no signed retail tenants but Douglas Development is in the process of speaking with retailers interested in the retail spaces. This corner is the last of the corners to undergo redevelopment at 10th and F St NW and it will complete the aesthetic upgrade sorely needed by the intersection. Washington, DC – May 21, 2013 – Douglas Development today announced that it had partnered with the real estate brokerage firm, CBRE, on a new boutique office and retail project in Washington, DC’s Penn Quarter neighborhood. Located at 1000 F Street, NW, the 11-story, trophy office building will occupy approximately 93,000 square feet and include 7,000 square feet of ground floor retail space. The building will offer two floors of below grade parking, outdoor terraces, and a terracotta façade. 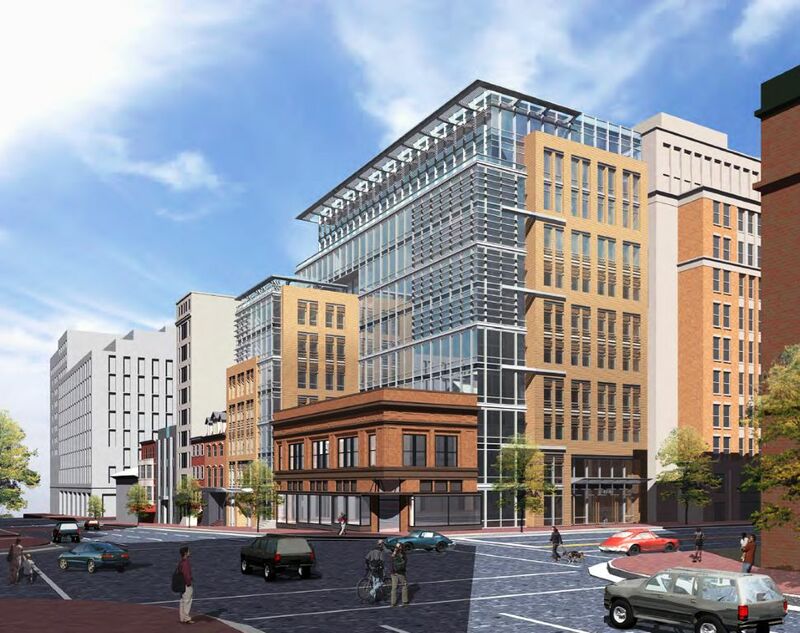 Designed by the highly acclaimed architectural firm Shalom Baranes Associates, the 1000 F St, NW project will incorporate a two-story designated historic structure, the facades of which will be restored, and the interior renovated and fully integrated with the contemporary building. The building’s structure will consist of post-tensioned concrete floors and reinforced concrete columns on a mat slab foundation. Construction is scheduled to begin in late 2013.